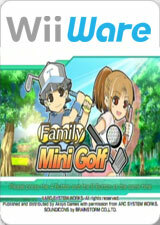 Test Your Golfing Mettle Against The Family in Family Mini Golf! Daddy, Mommy, Sarah, and Billy are back for some mini-golf action! Play through multiple golf courses that contain obstacles ranging from bumpers to speed ramps to fans and more! Up to eight players can play with one another using a single Wii Remote! See who among all your friends is truly the best at tackling every course. You can download new courses to continue the fun-filled mini-golf experience. They up the ante, creating even more complex and difficult mini-golf courses to overcome. Can you conquer all the courses and become the mini-golf champion!? The graph below charts the compatibility with Family Mini Golf since Dolphin's 2.0 release, listing revisions only where a compatibility change occurred. This page was last edited on 16 January 2018, at 06:14.